Stage 2 breast cancer means that cancer cells have is still contained within the breast itself, and in some cases it has spread to nearby lymph nodes. 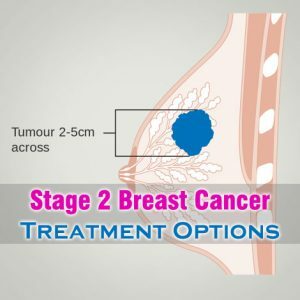 Stage 2 breast cancer is further categorized into Stage 2A and Stage 2B breast cancer. Stage 2A breast cancer means that the tumor is less than 2 cm and has spread to less than 4 axillary lymph nodes or the tumor is 2 to 5cms and had not spread to axillary lymph nodes. Stage 2B breast cancer means that the tumor is 2 to 5 cm and has spread to less than 4 axillary lymph nodes or the tumor larger than 5cms and had not spread to axillary lymph nodes. Surgery is standard for all stage 2 breast cancer treatment options. There are more chances of survival in stage 2A breast cancer when compares to stage 2B breast cancer. While going for traditional and well-accepted procedure of treatments Surgery becomes the first option. Depending upon the size of the malignant tumors surgeons decide whether it is a case of lumpectomy or mastectomy. Lumpectomy breast cancer surgery is done when the tumor is small. In this surgery, tumor and some of the tissues around it are removed. Mastectomy is generally considered when the tumor size is large. In this surgery, the whole breast is removed. Lumpectomy Breast cancer surgery is followed by radiation therapy. Radiation therapy helps in treating cancer cells that have spread to lymph nodes. Some cases of mastectomy also need radiation therapy. Chemotherapy is also one of the common suggested stage 2 breast cancer treatment options. In chemotherapy, drugs are given to destroy any leftover cancer cells that were not removed with surgery. Hormone therapy is used after surgery, if it is a hormone receptor-positive cancer. Sometimes, it is started even before surgery. This type of breast cancer requires estrogen hormone for growing. Hormone therapy helps in blocking estrogen action on cancer cells. Targeted therapy is used for treating HER2-positive breast cancer. Basically, it controls the proteins that cause cancer. It is quite clear to most of the individuals that any form cancers has some stages of growth and earlier it will be detected lesser it will be life threatening. These drugs are generally given along with chemotherapy drugs.